It’s interesting that this year’s tournament was missing some star players, such as Tiger Woods, Phil Mickelson and Adam Scott; all of whom decided to pass on the match-play event. In the end, Jason Day ultimately ended up winning the tournament after an exciting and challenging few days on the course. If you happened to be in the area to watch the live championship, or even if you were watching it on TV, you most likely took notice of the tournament’s stunning setting. The Golf Club at Dove Mountain has been the home of the PGA Tour’s World Golf Championships-Accenture Match Play Championship for the past few years, providing players an unrivaled golf course for quality and luxury. Perhaps a lesser-known fact about this event is that surrounding the Jack Nicklaus Signature golf course is a luxury community which holds some of the finest golf properties in Arizona. As a homeowner in The Residences you will have the opportunity to be an exclusive member of The Golf Club. Year-round access to the 27-hole Jack Nicklaus Signature golf course. This Arizona golf real estate community also provides homeowners with little luxuries that create a casual yet sophisticated ambiance. Luxuries like valet and concierge services, the option of cooks and housekeepers, as well as access to The Ritz-Carlton hotel and spa amenities. 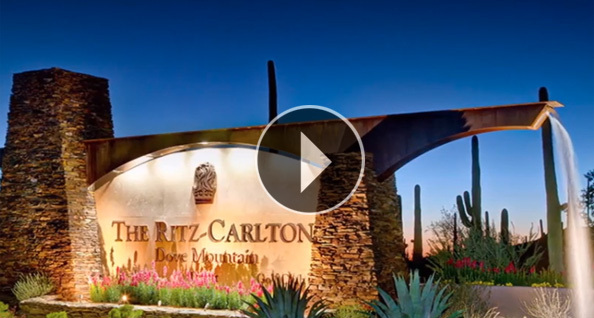 These perks are all part of what makes The Residences one of the best Arizona golf properties. These Arizona golf homes start from the high $600,000s to over $2,000,000 and estate homesites start from $450,000. For more information, visit http://theresidencesdovemountain.com/ or contact us today.